Hi everyone. 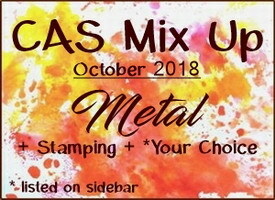 Today's card is for the CAS Mix Up October Challenge - Metal. This month's challenge is being hosted by the very talented, Mac. This will be a birthday card for my oldest son who turns 35 in November. Where do the years go??!! He likes all things mechanical and so I bought this die from AliExpress to use specifically on a card for him. I think it's really cool. I started by sprinkling Lindy's magicals on mixed media paper and spritzing with water. I kept adding more powders and sopping up any excess water as I went along. I used three colours of magicals (hydrangea blue, cattail copper brown, and bells of Ireland). By adding more and leaving it to move and bloom, I ended up with very intense colours. I cut the gear frame from the magical panel and also from a panel of heavy white card stock. With the white die-cut, I pressed it into a Versamark pad, dipped it into copper embossing powder, and heat embossed. I repeated this to add three full layers, which helps the powder to melt very smoothly and adds a thick layer. I inlaid the magical powder panel, adding in a few of the gear pieces and leaving some empty for more interest. I hope you'll join us for this fun challenge. Check out the challenge blog to see the amazing designs from our Guest Designer Pat (Colourful Card Creations), along with our designer's cards. Also wanted to welcome the newest member of the CAS Mix Up Design Team. Welcome to Susan Joyce (CatsInkcorporated)!! So happy to have you on the team Susan! Sending this over to Simon Says Stamp Wednesday - Anything Goes challenge. I really love this card, Loll! 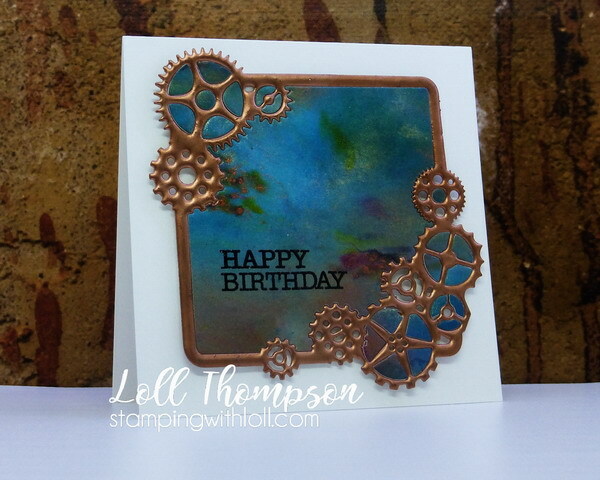 The copper frame and gears are so cool and work perfectly for your son with his mechanical interests! Your background is so striking with all those rich colors and the shimmer really adds drama to your overall design...An awesome masculine birthday card! LURVE the copper frame and the finished result. This is truly a fabulous masculine card! I have to agree, that frame is so perfect for a masculine card too. Love the triple embossing as well as the beautiful background you created with Magicals. He'll love this card! This is a fabulous card for a guy. Your son is going to love it! I really like the sparkleof the Lindy's stuff against the copper widget frame. Love these copper gears, Loll! The multi layers of embossing make them look so dimensional! A perfect masculine birthday card that I'm sure will please Evan! Oh gosh, Loll, that background is gorgeous! Thanks for sharing how you created it. The gear frame is also very cool. They work together wonderfully. I'm sure your son will be thrilled with this card. And truthfully, you look too young to have a son who is turning 35. I hope he has a wonderful birthday! What a perfect card for your mechanical son. The copper just makes the gears look so authentic. Love that background. Happy birthday next month to your son. Great die cut for a Male themed card Loll and the layers of copper embossing work together so well with the Magical colours. Awesome design! Thanks for your lovely comments and welcome to the Design team. Such a gorgeous masculine card for your son! Lovely background and fab gear frame! I’m sure he’ll love this awesome birthday card! How those colours of Magicals combine so beautifully with the copper. This is a stunning card Loll, your son will be soooo happy. The layers of EB give this card so much dimension. Good idea to leave some pieces out ...adds to the 3D effect. Another beautiful card dear friend! Your Lindy's magicals background is amazing! Love the stunning colors, shimmer, and blend of colors! (OK, now I know what colors of Magicals I should buy next.) The 3 layered heat-embossing of the gear frame looks so smooth and shiny! Leaving some of the gears holes empty does add more interest and let the air flow. Three thumbs up, Loll! Spectacularly designed and implemented! Can you tell I LOVE it?! OMGoodness look at the gorgeous shimmer from those Magicals - really is magical. So glad you showed a close up. 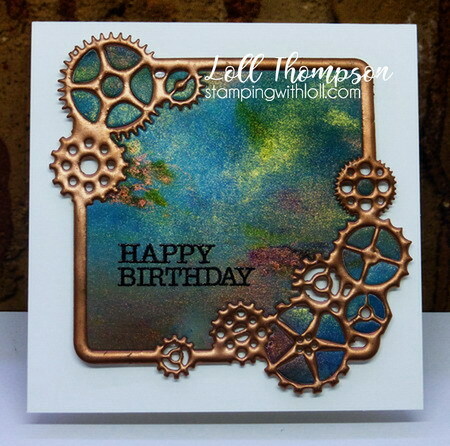 Awesome background and a super male card with the melting metal cogs. Also like how you left a few bare. Fabulous card Loll. You son will love it for sure. such a super cool looking masculine card...just perfect for the challenge! Sure he will love it. You have created this mechanism so wonderfully. It looks like it was actually made of bronze. What an amazing feeling when you look at this card and you know that it's not metal ... This illusion is so realistic. Real magic, Loll!